My brother Sean and I have headed to Dublin to visit some accounts and attend the Digital Media Awards tomorrow night. Tonight, we decided to splurge and feast at Thornton’s. Here’s a video of the desserts. Mine was a warm chocolate tart with raspberry sorbet and rasberries. Sean had a blood orange souffle with mandarin sorbet. Memorable! For those interested, Kevin Thornton has a lively blog here. Yesterday my brother and I went to the Taste of Dublin at Dublin Castle. The idea was to be able to sample some of the dishes of Dublin’s best restaurants, including Roly’s Bistro, L’Ecrivain, Chapter One, Diep le Shakar. 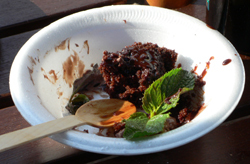 In addition, there were food producers handing out samples or selling their wares, and cooking demonstrations by chefs. The afternoon was sunny, and a huge crowd turned up. The wine flowed, the music pumped, and the various restaurants churned out small portions of their dishes on paper plates. We met some friends there and had a good time, although it was a bit disappointing to see many big corporations such as the ubiquitous Starbucks along side the small Irish producers. Today, on a damp, cold morning, we visited a few of our customers in the city and then headed home. As I crossed the border into Kerry, the weather improved, and it struck me as always just how lucky I am to be living in such a beautful place. I headed out the Dingle peninsula toward the sun listening to John Kelly’s Mystery Train and very happy to be out of the city and back home. My brother had signed us up for Bord Bia’s International Specialty Food Forum, and since ten companies including Tesco and Jurys Doyle expressed an interest in meeting us, he asked me to hang around in Dublin for couple of days and help him out. I didn’t need much coaxing. The meetings are not until tomorrow, and it is funÂ beingÂ a tourist in the capital. Last night I ate at Dunne and Crescenzi, nestled in next to the Piedmont wines, and it was a tasty, light option as I had gorged on juice at the aforementioned Fallon and Byrne, and did not have a huge hunger. For people complaining about value in Ireland, this restaurant chain certainly would not bust the wallet, and a simple but delicious insalata caprese made with buffalo mozzarella and a nice orvieto went down a treat. Then it was off to the Abbey to get a bit of culture. Aurelias Oratorio was the offering, performed by Charlie Chaplin’s granddaughter Aurelia ThierrÃ©e. It is a visually stunning piece and quite a bit of fun. 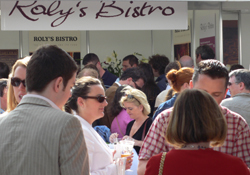 Tonight I think we will head for Rolys Bistro, and who knows what else!